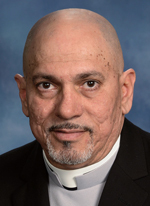 Deacon Manuel A. Beltran, 55, a permanent deacon assigned to St. Martin of Tours Parish, Philadelphia died Jan. 17. Deacon Beltran was scheduled to receive the papal honor, Cross Pro Ecclesia et Pontifice (For the Church and the Pontiff) on Sunday, Jan. 21 at a ceremony at the Cathedral Basilica of SS. Peter and Paul presided over by Archbishop Charles J. Chaput. The award was accepted in his name by his wife, Becky Espanol, who also received the award. Deacon Beltran was born in Chicago, Illinois, the son of the late Antonio Beltran and his mother, Gloria (Hernandez) Beltran. His family relocated to Arecibo, Puerto Rico when he was very young. He came to Philadelphia 30 years ago and began a career as a welder. Most recently he was a supervisor with U-Haul until illness forced his retirement. He and his wife raised three children, Hazel, Emmanuel and Ferdinand. Deacon Beltran was an active member of the former St. Hugh of Cluny Parish where he was a musician and choir member. He was part of the Hispanic Prison Ministry for approximately 20 years, visiting monthly to play and sing at services. More recently he and his wife have been coordinators of the San Juan Pablo II Family Apostolate at St. Martin of Tours Parish in Philadelphia where they offered pastoral counseling and retreats for Hispanic couples around the archdiocese. He was ordained a permanent deacon June 6, 2015 by Archbishop Chaput and assigned to St. Martin of Tours. “Manuel was a holy and special person and so is Becky,” said Deacon Michael Pascarella, associate to the vicar for clergy, overseeing the Department of Permanent Deacons. Two years ago Deacon Beltran’s very serious and life-threatening cancer was diagnosed. His brother deacons of the class of 2015, spearheaded by Deacon Mark Kuhn, rallied around him, raising sufficient funds to send Deacon Beltran and his wife on a pilgrimage to Lourdes, France. He returned from Lourdes with his cancer in remission and took up his pastoral duties with renewed vigor, according to Deacon Pascarella. However the cancer flared up again last year, and his fellow deacons once more funded a trip to Lourdes. This time when he returned, although he was in good spirits, there was little change in his cancer. Again he resumed his parish duties as long as he was able. “When he was dying, he accepted God’s will and was at peace,” his wife told Deacon Pascarella. There was a viewing for Deacon Beltran at St. Martin of Tours Church Jan. 23 followed by his funeral Mass with Archbishop Charles J. Chaput as the principal celebrant. Assisting at the Liturgy the Word and preaching was Deacon Kuhn. The deacon assisting at the altar was Deacon Jose Hernandez, and the deacon chaplains were Deacons Andres Carillo and Jose Lozada. In addition to his wife and children, Deacon Beltran is survived by his brothers Carlos and Luis, and his sister Evonne. Interment was in his family plot in Puerto Rico.